A young woman sits on the ground as police guard the area following the explosion at a Manchester concert. The pattern has become all too familiar. Young people gathered for a musical event find themselves subjected to what British Prime Minister Theresa May has described as an “appalling terrorist attack”. While there is no confirmation as yet this was a terrorist-inspired incident, police suspect the Manchester attack, which has so far killed 22 people and injured 59 others, was caused either by a bomb contained in an abandoned backpack, or was the work of a suicide bomber. At this stage no group has claimed responsibility. But it is not being overlooked that last week Islamic State released a 44-minute video in which fighters of different nationalities urged their supporters back home to carry out acts of violence. Among those featured was a British man. What makes Islamic State more dangerous – even desperate – in the current climate is that it finds itself under enormous pressure in its strongholds in Iraq and in Syria. Its grip on the northern Iraqi city of Mosul is slipping, and it is under threat in its Syrian redoubt of Raqqa. It is important not to jump to conclusions about the identity of those responsible. However, whatever judgements might be made about the carnage at a Manchester music hall, this latest bombing underscores the vulnerability of European cities to such acts of violence. Underscoring the deep-seated shock this will be causing in Britain is that this is the worst terrorism-related episode since the 2005 public transport bombings in London in which 52 people died. Since 2015, more than half-a-dozen terrorist attacks have been carried out in various European locations, including France, Germany, Belgium and Britain, and in the case of several of these countries there have been multiple incidents. What the governments of Europe have on their hands are threats to personal security that can strike at any time and in any place, as various terrorist incidents in the past year or so have demonstrated. This poses an enormous challenge to security agencies, including the police, and, in the case of Britain, MI5, the spy agency responsible for internal security. Such random acts of terrorism are enormously difficult, if not impossible, to counter unless open societies are subjected to security measures that most citizens would find difficult to accept. If it proves to be the case the Manchester bombing was carried out by a sole suicide bomber, or a bomb-laden backpack placed strategically, this would underscore difficulties in policing a musical event in which large numbers of people gather in a specific location. While France has been the main victim of a wave of terrorism in the past several years, Britain is running second. In the most recent incident prior to the Manchester bombing, the driver of a vehicle mowed down pedestrians on Westminster Bridge and then shot a policeman outside the Houses of Parliament. 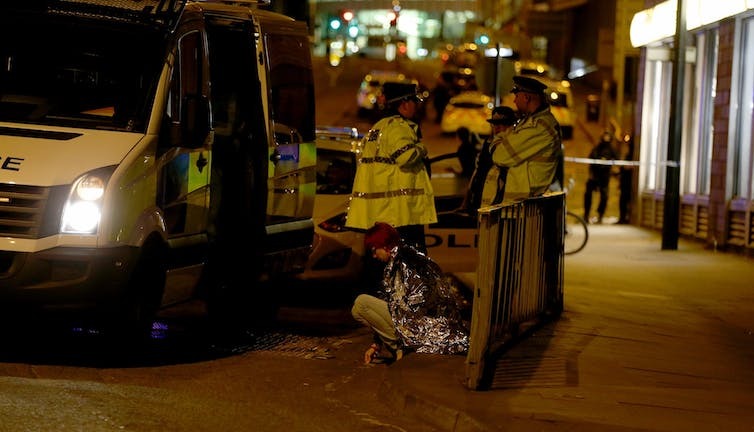 The concert hall attack in Manchester recalls a similar episode in Paris at a the Bataclan concert hall in November 2015 when shootings caused multiple deaths. Islamic State claimed responsibility on that occasion. What is adding to political complexities of the Manchester bombing is that it comes in the middle of a British election campaign in which immigration and Britain’s withdrawal from Europe are central questions. How this will play out in the next days and weeks is difficult to assess, but as a rule of thumb such incidents would be more likely to benefit the parties of the right than the left. On the other hand, governments in power and therefore responsible for security inevitably face awkward questions about levels of preparedness for such terrorist incidents, if indeed that is what we are talking about in the case of the Manchester bombing. Terrorist violence is now baked into the European landscape. It is hard to see an end to this. * Note: This story has been updated to reflect the latest information on fatalities. This entry was posted in Ariana Grande, ISIL - Islamic State in Iraq and the Levant, Islam, news, United Kingdom and tagged Ariana Grande, article, attack, concert, Is, ISIL, Isis, Islam, Islamic State, Islamic State in Iraq and the Levant, Manchester, music, Muslim, muslims, news, suspected, terrorist, United Kingdom. Bookmark the permalink.